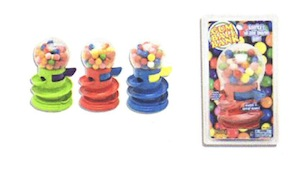 Gumball machines can be found everywhere but they can be costly and the gumballs hard. Well, this gumball bank can be reloaded with fresh gumballs anytime you want and works as a savings account for change! How do you like them apples!... Flavored Gumballs. Includes Gumballs.